Mark Zuckerberg and his wife are also on a quest to end aging and disease. They just invested 3 billion dollars in research. As you can see from Zuckerbergs quote, Silicon Valley has begin its war on disease; Mark Zuckerberg, Google, Microsoft, Peter Thiel among others are all on a quest to end it. Is there a reason for you and me not to join forces and hack biology with them? If you think about it, would you like to get sick tomorrow and die a slow death, or that your loved one got ill and died? Do you really want that to manifest? Rationalize it.. You'd rather stay young and healthy forever, if you had the chance, wouldn't you? 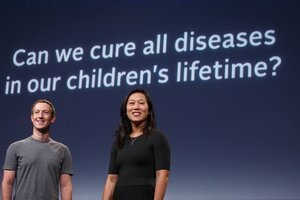 Mark and his wife just started the Chan Zuckerberg Foundation to fight it. They've hired top scientific leaders to oversee 3 Billion dollars to help cure, prevent and manage all diseases in our children's lifetime. Both of the Google Co-founders Sergey Brin and Larry Page has said that they hope to someday cure death. Together with Bill Maris, the president and managing partner of Google Ventures, they invest millions in companies that can slow aging, improve longevity, and possibly reverse disease. "If you ask me today, is it possible to live to be 500? The answer is yes," Maris told Bloomberg Markets. Google has also started a project called Google Calico (short for The California Life Company), a multi-million dollar project that's studying how to reverse aging. Google alone reportedly has invested $240 million in the project, where Arthur Levinson is the Chief Executive. Microsofts main focus at the moment within the field of disease is fighting cancer, this they do this by using computer science such as machine learning and algorithms. Craig Venter founded the well known company Human Longevity Inc. , a genomics-based biotechnology company, with the intention of extending and enhancing the "healthy, high-performance lifespan and change the face of aging." The company has reportedly raised at least $70 million in venture capital. Martine Rothblatt, is a woman thinking the way I do which makes me super excited to follow her projects. She is taking a unique approach to the anti-aging trend. Rather than keeping humans alive in their current bodily forms, she believes that immortality could come through a unique blend of technology and biology(https://www.cnbc.com/2015/05/04/live-forever-maybe-by-uploading-your-brain.html). The founder of Sirius Satellite Radio and CEO of United Therapeutics is betting that one of the first stages in this process may be uploading the "data" of a human brain into a software program, essentially keeping their being alive in a different, high-tech form. She's created a nonprofit called Terasem Movement where people can already store their "mind files," the digital records of a person's life spread across email, social media, and computer files, so that when technology does catch up those files can be used to essentially bring that person back to life. The Palo Alto Prize is a newly established Silicon Valley-based initiative of the Race Against Time Foundation. The Paolo Alto Longevity Prize is all about creating engagement and encourage people and companies to join in and help hack the code of aging. The prize is 1 ,000,000 Dollars with hedge fund manager Joon Yun in the front. So, the tech titans are donating billions or personally leading the research into longevity solutions. What I'd like to focus on in this post is aging, the worst disease of them all that attacks us humans. You might be thinking, aging? Is that a disease? Well, more and more scientists believe in the fact and research shows that it is. It might be difficult to grasp as the world is currently in a “pro-aging trance”, meaning we are happy to accept that aging is unavoidable., when the reality is that it’s simply a “medical problem” that science can solve. Unclear? Yes, it doesn’t explain much really. To give the scientific overview one can explain it like this. “Its the life-long accumulation of “damage” to the body that occurs as intrinsic side-effects of the body’s normal operation. So basically aging is a gene causing cell damage, to give you a visual input; think of a car, when buying a new one you dont expect it to stay brand new and in perfect shape forever? Do you? No, we all know that by using our cars it slowly gets teared down unless you repair it, pure physics, so every now and then you have to drive to the service station for an upgrade. We humans do not have such a service station, yet. Therefore, aging kills 100.000 people every day, and will end yours too eventually, if we don't find a cure before your time is up. I'm really passionate about this topic as I believe that we are the first generation that can cure aging. This is because of our knowledge and equipment for advanced computing, AI, machine learning, genomics, DNA engineering, biotech and nanotech. “We’re now at the point where it’s easy to extend the lifespan of a mouse. That’s not the question any more, it’s can we do this in humans? And I don’t see any reason why we can’t,” says David Sinclair, a researcher based at Harvard. So, we are not far away thanks to the magic of the Genetic Engineering and the stem cell revolution. Gene editingare getting more advanced and way cheaper. Over night the cost has shrunk by 99 %. Instead of a year it now takes a few weeks to conduct experiments, and basically everyone with a lab can do it. Remember, if we target an aging process and slow it down then we will slow down all the diseases and pathology of aging as well. That’s revolutionary and has never happened before. Hence, the global market for healthy human longevity is enormous well over $7 trillion. Aubry De Greya British researcher is the most famous spoke person and pioneer on aging as a disease and has done several TED talks, one is added below. He has also written this book, which you should definitely consider checking out. He says that aging is curable and he claims has drawn a roadmap to defeat biological aging. According to him humans age in seven basic ways, all of which can be averted. He says that we have known about aging as a disease for two centuries but it has up to this date mostly been ignored by scientists because its been to difficult to grasp. He provocatively proposes that the first human beings who will live to 1,000 years old have already been born. Another person who is deeply involved with this cause is the successful internet entrepreneur Michael Greve who just donated 10 million dollars to the Sens Foundation and also founded his own foundation to battle it, [Forever Healthy]Foundationhttps://forever-healthy.org/en/. Watch a talk by him on aging below. How come I am obsessed about this and why do I look at it as a highly important first priority cause? Obviously, I've been hit by a storm off questions on why. What the heck do I want to do on earth forever? And why should we mess with the "natural" cycle of life? And isn't it gonna be great fun to check out where death will take us? Well, first of all, this is not the "natural cycle" of biology, there are at this day several species, bacteria and plants that do not have any signs of aging even though they have been living for 500 years (shark), jelly fish, lobsters, alligators ie just die if an accident happens to them, or if they get a disease(not aging) etc.. So, we are just the unlucky ones hit by the aging gene and no restoration one. And the other things, is of course I'd never ever be interested in living on planet earth in a physical humanly body for eternity, which I know is not gonna be the case. What will happen within the next century is to us incomprehensible as our human brain is made to think linear. But you see, nano tech, biotech, quantum computing and AI can take us anywhere, really. Soon we will be able to live on other planets, in different galaxies and universes and so on. We will probably be able to manipulate ourselves into literally anything. Upload our consciousness to a nano boots and go anywhere.. and transform ourselves to anything whenever wanted and needed. Thats why I want to stay alive. I'm so curious about all this, existence and consciousness and the nature of reality. So I just want to understand it all and explore. I’d love to experience living in different shapes and formes, not just in this body of flesh and bones limited by gravity. Thats why Im so eager to continue my spiritual journey. You might be thinking that us regular people won't be able to afford such a cure but believe me, you will. The prices will shrink as low as the pills you nibble today. Over night. Due to our exponential growth within the fields as of nanotech, biotech, AI and quantum computing. So no reason to not keep your head up. Then there is an interesting question which I also like pondering about; what will happen to the medical industry now when we are developing organic ways to solve and cure diseases? Will it die completely? And how fast? I've been longing for a better solution than this synthetic madness which we accept within medicine cause we got no where else to go. I think its be quite an interesting collapse. The pharmaceutical industry have been dominant for the past century and has basically been doing whatever they want to the world and to the people in order to earn money by "saving" peoples lives. Yes, its a good thing but after what Ive been reading after digging into it too me it seems quite shady and corrupt. I think that within 100 years or sooner people (and computers) will laugh at us hysterically, in many ways because of our ignorance and stupidity. They will pity us. The same way we do when we think about solutions and way of doing things back in the old days when they were without the knowledge of today. Think about it, its so stupid how we do it today, so fake, synthetic, its dangerous, literally, we have no idea what we are doing. Even though billions of dollars are being invested there is still need for support as this is extremely expensive research and it is nothing that the governments are funding, yet. I guess they will do eventually when they see how much of a benefit it will be to our society. Unless they are corrupted by the pharmaceutical industry.. Think about what disease cost our society every year? That's a loooot of money and way too many lives. If you have a wish for becoming fragile and die thats ok, but perhaps a person you really love doesn't want it? So, support her or him.. I encourage you to activate yourself and help save peoples life. You can always kill yourself when you're tired from living your life. No pressure. The more money they collect the faster we all can see an end to this. They need great brains and equipment. Seriously, every dollar counts. So only donating one dollar is of huge value. The last golden question is the following..
What keeps you from participating? The people who will figure out how to reverse and cure aging will go down in the history books and cash in loads of money. Hey, it could be you. Remember, you can always kill yourself when you're tired from living your life. My personal take on living forever? I'd love to, hopefully being stuck in this biological body is one of many options. I could be a quantum particle, with my consciousness onboard and be able to transform myself into anything I wanted. Whatever was suitable for living on venus, whatever suitable for living in other galaxies and whatever suitable living in space and outside our universe. Thats why I wanna stay alive, to explore the vastness of it all, and figure out what this is all about. The theory of everything. Want to learn more about me? Read my #introduceyourself post here. The medical industry is going to get disrupted in a big way. My forecast is that we will look back in 10 years and laugh that we argued over how to pay for medical costs. Things are going to get substantially less expensive when it comes to medicine. I believe the present biological cap of about 120 years will be exceeded in the next 20 years. One of the biggest problems is the damage done to cells from the metabolism process. This is why fasting is considered a way to extend life (traditionally). We will over come this at some point. If you look at the diseases that took many people down are being attacked. Heart attacks are less fatal than in the past. That killed people in their 50s and 60s...now people who dont die from heart attacks get cancer. We are making progress there which leads people in their 80s getting dementia. Of course, we see a lot of research in this area. The next 10 years will see a radical advancement in medicine. We still are in the dark ages overall when it comes to the progress we are going to make. As for the tech titans, they are young and rich and now want to live forever. The @OriginalWorks bot has determined this post by @yrja to be original material and upvoted it! To nominate this post for the daily RESTEEM contest, upvote this comment! @taskmaster4450 thanks for adding a reflective and informative comment :) I believe we're gonna laugh as well, at many things. Great that you mention fasting this is indeed pretty interesting. It should've been taught in school, cause it benefits both mental and physical health not just in extending life.. Way too many essential things which should be general knowledge sadly isn't taught in school.. but hopefully in not too many years we will see a shift!! Thank you so much for sharing your words and tag originalworks ! :D Appreciate it! Thank you! But most of all, thanks for reading! @clumsysilverdad thanks for dropping me a comment and upvoting :D ! That sounds like a great thing to do hehe, luckily it seems like war is decreasing and I think that for sure will continue. Don't know about the timeline though he he. Upvoted and resteemed - it's nice to see others share my view that we should address aging itself and cure this horrendous disease.